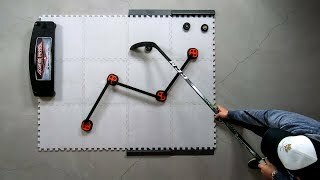 Build a fully functional stickhandling, passing and shooting zone with the HockeyShot Home Training Center. For players with limited access to ice time, it’s one of the best ways to sharpen on-ice skills so you’re a more valuable player on game day. Can't get enough practice time in at the rink? 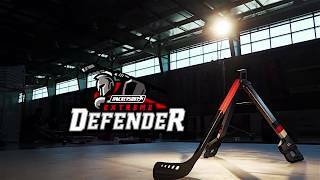 Bring it home with this full stickhandling, shooting and passing training zone you can easily build either in or outdoors. 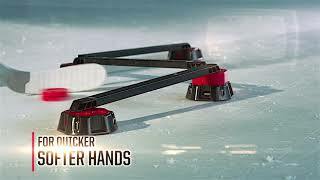 It recreates the slickness of the ice and gives you the room to work on everything from toe-drags to wrist shots. Includes 144 sq. 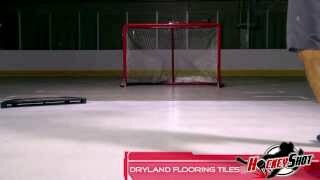 ft. of Allstar Dryland Tiles, (1) HockeyShot Extreme Passer Clamp-on Pro 30", (1) Speed Deke Trainer: Off-ice, (1) Extreme Defender, (2) Puck Stopper Edges, (2) Smooth Edges, (1) Green Biscuit, (2) Extreme Dryland Pucks and (1) Extreme Stickhandling Ball. Recreates the slick, smooth feel of the ice. Perfect for a garage or driveway as the tiles are strong enough for cars to park on. 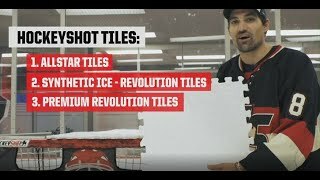 Order additional tiles to expand your training square footage. Enhance your playing experience and keep the puck in bounds by ordering more Puck Stopper Edges!